Chalcedony with embedded fibers of amphibole minerals (used by RJ Haüy to include tremolite, actinolite, tourmaline and hornblende) with varying degrees of alteration. The fibers cause a chatoyancy similar to that seen in tiger’s eye, but tiger’s eye is not made of chalcedony, it is macrocrystalline quartz. Pietersite is found primarily in Namibia. 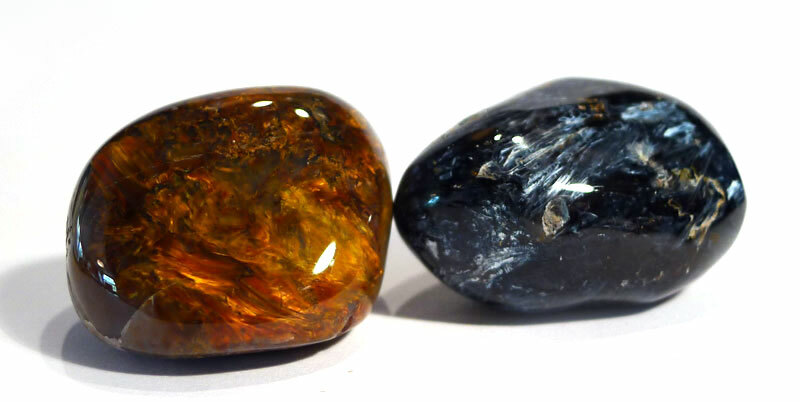 Properties: Gienger refers to pietersite as the “storm stone”, as it offers assistance during chaotic periods of our lives. It can help to us to assimilate changes and clear up confusion. It is also known as the “Keys to the Kingdom of Heaven”, and can create a link between earthly consciousness and a connection with the Divine. It helps us to gain compassion and love towards the human race, enabling a feeling of brotherhood. In meditation it is known to stimulate visions. In healing it stimulates the pituitary, thereby regulating the entire endocrine system.